At Sussex Transport we don’t just run trucks around the UK for our Clients. We organise and ship freight all over the world for our clients. Just this week we have vehicles in Norway for one of the worlds top social brands and we have also been shifting a rather funky Whisky Pouring Machine into Dubai for one of the global leaders in alcohol. In fact, the Whisky Pourer is something we have been shifting all over the world for a while now. When goods are temporarily imported and exported for exhibitions and trade fairs the paperwork and processes change. This is to ensure the goods don’t incur local duties in each country. Temporary importing like this is often carried out using a document called an ATA Carnet. What is an ATA Carnet and why would my business need one? According to https://www.londonchamber.co.uk “The ATA Carnet is an international Customs document which allows the temporary importation of commercial samples, professional equipment or goods going to either a trade fair or exhibition to countries which are part of the ATA Carnet system. Without an ATA Carnet it would be necessary to go through each country’s customs procedures for the temporary admission of goods e.g. lodging a temporary import bond. The ATA Carnet simplifies the custom formalities by allowing a single document to be used for clearing goods through customs in the countries that are part of the ATA Carnet system. Import and Export advice and support is also part of the Sussex Transport Package, so you can be assured we’ll provide all the information and assistance to help maximize the efficiency and minimize the time it takes your freight to reach its destination. 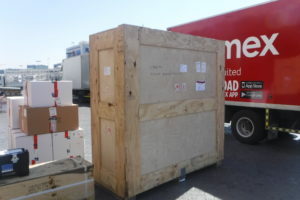 This entry was posted in Delivering to..., News, Where are Sussex Transport going... and tagged ATA Carnet, Dubai, Exports, freight Logistics, Freight Transport, imports, International Freight. Bookmark the permalink.